I was asked to teach a few classes on frugal food for the ACE program in conjunction with the Boys & Girls Club and our local ISD. My aim was to have reasonably inexpensive, healthy, and most importantly tasty recipes to share. Each class I would provide the recipes and demonstrate them. And let me tell you, being a cooking show host is harder than it looks. 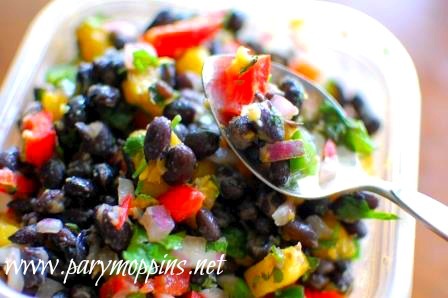 This recipe for black bean salad is a favorite in our house and was the run away hit in the class. Mix oil, lime juice, garlic granules, and salt together. Adjust seasonings to taste. Mix all remaining ingredients in a big bowl and pour dressing over top. Mix well. This looks so good and easy! I've already printed it out. I think it would be a great one for me to make during the week because the kids wouldn't like it and then I would actually get to eat something! I like the mango here! Can't imagine how many takes I would need on a cooking show. Do-over city! Thanks for the information Ms. Elin! :) I'm flattered.